Written by a leading contract lawyer with extensive teaching experience, Contract Law takes a unique approach to a complex subject. 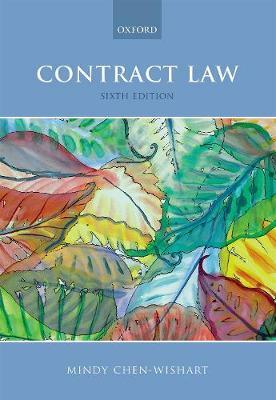 Chen-Wishart combines academic rigour with an innovative visual approach, presenting the law with diagrams, flowcharts and tables to provide students with a stimulating account of key principles and an engaging analysis of the complexities of contract law. Thought-provoking analytical features, such as the 'Pause for reflection' and 'Counterpoint' boxes encourage active and critical engagement with the topics. Online resourcesThe book is accompanied by a suite of online resources including animated versions of selected diagrams with audio commentary; guidance on answering the questions posed in the book; web links to key cases and legislation; updates; and two additional chapters on incapacity and illegality & public policy. Additionally, lecturers have access to a test bank, and electronic copies of the diagrams from the book.